What are your memories of being in the Super Bowl? 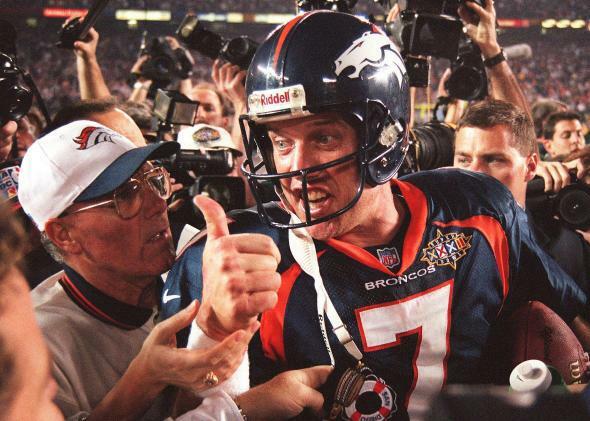 John Elway gives a thumbs up after the Broncos defeated the Green Bay Packers 31-24 to win Super Bowl XXXII. Ted Sundquist, general manager of the Denver Broncos from 2002-2008, joined the team as an assistant in 1992 and was there when the team won back-to-back Super Bowls in 1998 (XXXII) and 1999 (XXXIII). This is a very interesting question. The reason is that the situation in Denver right now is very similar to what it was in the mid-1990s. Last year, the Broncos fielded a 13-3 team, very strong—everyone felt that this was Peyton Manning’s shot to get his next Super Bowl, and he’s come in here and done what he has to do—and they ended up losing after a bye week to the Baltimore Ravens in the divisional round. If you think back to 1996, it was a very similar situation. Mike Shanahan had come back from San Francisco, and we were mediocre his first year back, 8-8, but that second season we went 13-3, same type of deal. John Elway, he’s in the back stages of his career, there’s a sense of urgency throughout the organization, and we fall on our face, losing to the Jacksonville Jaguars. We felt like here’s the opportunity, and we fell on our face! So the next season—and here we are in 2013-14, very similar to 97—we end up going 12-4 but we went on a really good run and then ended up losing two games late in the season, on the road to Pittsburg and San Francisco, and we finished 12-4 and at the wild card position. Kansas City had won the division. So who do we face the first week? The Jacksonville Jaguars, and we just throttle them. On the road, 42-17. We come back in the divisional round and we’re going up against our foe, the Kansas City Chiefs that we lost the division to , and we ended up beating them in Kansas City, which was something we had not done very well over the course of the ‘90s, 14-10. And then we go to Pittsburgh, which had beaten us in the regular season, and everyone thought that there was no way Pittsburg was going to lose to the Denver Broncos at home, and it was going to be a Pittsburgh-Green Bay Super Bowl. And we end up upsetting the Steelers there, 24-21. That first Super Bowl, there was a sense of destiny. We knew we had missed our opportunity in ‘96, and in ‘97 too many things started falling into place. It just made sense that this could be our year. We go into Super Bowl XXXII, decided underdogs against the Packers, who were returning for the second year in a row. The things that stick out to me in that particular game, first and foremost, was that it was the culmination of a career that had led to that point. I had played college football for the Air Force Academy, I had coached there, I’d grown up playing football down in Texas, and I just couldn’t believe that after all those years of football and being involved with the sport, here I was at the Super Bowl, as a member of the Denver Broncos, competing for an opportunity to win a championship. It was just a fantastic feeling. John decides not to retire. Terrell Davis at the time is probably the most dynamic football player in the NFL. He’s the equivalent of Adrian Peterson in today’s game at the position, and we go back into the season, and what do we do? We go on a 13-0 run. It’s more business-like the second go-round. The excitement is not there as much as the expectation of yeah, we’re supposed to do this, this is who we are, we’re the Denver Broncos. We end up losing two games on the road late in the season—again: We lose at the Giants and we lose at Miami, but we end up winning the division, and we’re 14-2. The Vikings finish ahead of us overall in the league at 15-1, and we both head our respective ways through the playoffs. We beat Miami, so we kind of got a little bit of revenge there, and then we go up against a Jets team that a lot of people didn’t think we’d be able to beat. I remember it being a very cold game, and it was a very close game, tough game, and we beat the Jets and the fear in Denver was: “How are we going to stop Minnesota’s offense?” And what happens is that Dan Reeves and the Dirty Birds end up beating Minnestota in the NFC Championship, and so here’s Mike Shanahan against his old boss/nemesis Dan Reeves, who now has made it to the Super Bowl a second time with a different team. And it was just business then. And we ended up beating the Falcons rather handily. It was close in the first half, but we pulled away. And I remember turning to a close friend of mine who was on the staff and just saying, “Hey, congrats!” And he was like, “Yep, uh, um, hey, congrats!” Nothing like the year before! So I hope it doesn’t get that way, where you just get used to it. It should always be something exciting and an accomplishment that you’re proud of that you’re able to look back upon. I probably get more excited about it now than I did then. That’s what I remember about those two, and I see the Broncos right now in a very similar situation. When teams don’t make the Super Bowl, what do they do during the postseason?